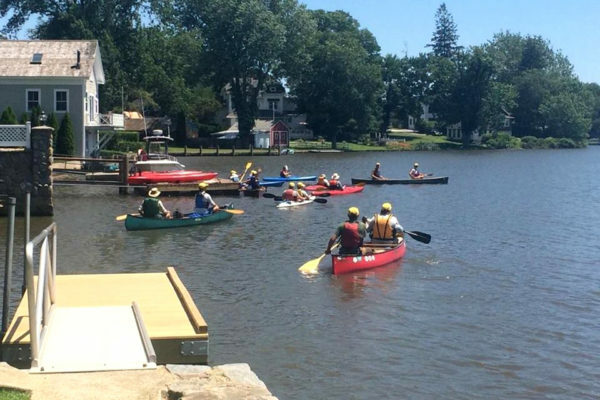 [Episcopal News Service] The paddle-carrying Episcopalians who created a church on the water for 40 days last summer are gearing up again to become pilgrims on the River of Life, this time with three shorter canoe and kayak trips in New England. When Blackmer says “bite-size,” he still envisions immersive natural experiences filled with fellowship, prayer and prayerful silence, as well as overnight stays in churches and at campgrounds. Last year’s Connecticut River pilgrimage has been shortened to nine days in July, with three segments for would-be worshipers to join and ending in western Massachusetts. The Diocese of Rhode Island also is hosting two weekend trips, one in May and the other in September. Replicating these waterborne pilgrimages always has been part of the plan for River of Life. “It is taking that practice of prayer, silence, contemplative practice into the natural world around us and saying that we can encounter God directly there and appreciate the entry into God that happens in the natural world,” Blackmer said. Blackmer, one of the River of Life organizers through his group Kairos Earth, hopes to produce by this fall a sort of wild pilgrimage guide to distribute to all dioceses of the Episcopal Church. The guide would help others to launch similar pilgrimages anywhere, whether on rivers or in other natural settings. This year’s Rhode Island trips also will serve as training sessions for paddlers who are interested in learning how to recreate such pilgrimages on their own, Knisely said. Six leaders-in-training will be among the 15 paddlers on the first trip, from May 17 to 20 on the Wood River. Knisely plans to join that trip, though he is still debating whether to take a kayak or canoe. He also is trying to convince his 24-year-old daughter to join him. The trip will include overnight stays at St. Elizabeth’s Episcopal Church in Hope Valley and Christ Church in Westerly, concluding there with a Eucharist on Pentecost Sunday and Knisely preaching. Details, including location, are still being worked out for the second Rhode Island trip, from Sept. 5 to 8. Both trips will cover 20 to 25 miles, with water passages that aren’t too strenuous. Paddling to exhaustion would defeat the purpose. These pilgrimages are slow enough for the pilgrims to pray and silently contemplate their surroundings – the homes along the riverbank, the mist rising off the water, wildlife all around. Knisely recalls the sound of water burbling under his kayak as an eagle flew overhead during the 2017 River of Life pilgrimage. That first-year pilgrimage was a collaboration of all Episcopal dioceses in New England, as well as the New England Synod of the Evangelical Lutheran Church in America and several conservation groups. It covered more than 400 miles, from the source of the Connecticut River near the Canadian border to Long Island Sound. Only the trip’s guides, Mark and Lisa Kutolowski from Metanoia of Vermont, journeyed the full 40 days. About 55 paddlers joined the trip during various segments. Another 50 to 60 signed on as “pilgrims in prayer,” following along with the River of Life prayer guide. Hundreds more participated along the journey by hosting the pilgrims or attending various celebrations. One memory of the 2017 trip sticks with Blackmer. He was with a group of about 10 canoes and kayaks in the middle of one of the segments in Connecticut when they spotted some activity on land.